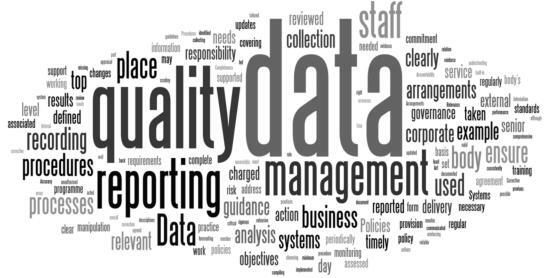 Sooner or later, all businesses suffer from data quality issues. Duplicated records, incorrectly keyed-in data, and incorrect address information – the list goes on. According to a recent study, it was found that poor data quality can cost an organisation as much as 20% of its operating profit. That means a lot of time and money is spent on fixing up bad data problems. Traditional Data Quality solutions are managed by IT. This usually means reports or spreadsheets get thrown around the organisation. A very messy and time-consuming process that can introduce more problems. QFire takes away all the pain of managing poor data. For a start, QFire is provided as a web-based system for managing data quality, where business users can set the rules and manage the process – with no intervention from IT. This makes QFire a perfect match for Data Warehouse Automation tools, and especially cloud-based data warehouses. QFire quickly takes the user through six areas of data quality management via a friendly web-interface (no more spreadsheets). Understand QFire helps you understand the data before trying to determine what amendments need to be applied. QFire Understand incorporates profiling information and quality metrics that highlight the health of the information being used. Collect Data can come from many places, and its collection is rarely a one-off process. QFire’s import templates allow you to acquire information from the same external source repeatedly. Information comes in many forms and QFire Collect can pull data from databases, flat files, spreadsheets, pdf, word documents, email and a number of other formats of structured and unstructured data. Validate Defining validation rules can be complex and time consuming, often requiring complex SQL statements written by technical staff or consultants. With QFire’s Plain English Rule Editor, the task of creating rules is made simple and can be managed by anyone who understands the information. 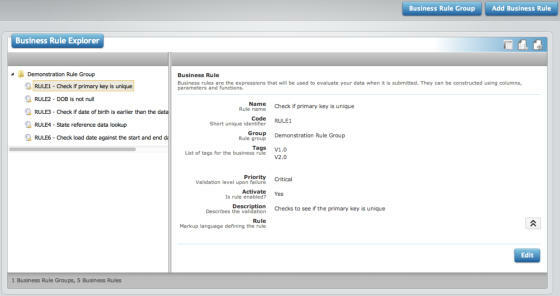 The rule editor allows look-up checks, comparisons and integrity statements to be added without coding. QFire’s set-and-forget built-in smarts help you quickly build the validation rules you need to apply to your data, and when a new data item blocks the flow, QFire Validate tells the user where the error lies, how to find it and what piece of information is invalid. Protect Once your data has passed validation, QFire Protect’s Quality Firewall lets you to determine whether you wish to just be notified of errors or to protect your systems by rejecting a row of data or an entire dataset. You can decide whether an error should be marked as critical, high, medium or low, and at what percentage of errors should be allowed before data is rejected. Monitor QFire Monitor tracks all the details of the data submitted for collection. Through the use of a built-in version control, users can check the current submission against a previous submission to monitor changes in quality. QFire’s Quality Scoring allows you to see if the data quality is improving from a collection source and can even compare collections from other sources, so you can visualise the overall health of your data. Enrich Your data is valuable once cleansed. However, enriching your data can significantly increase its value. QFire integrates with a number of third-party products for data enrichment, including adding geo-coding for location information, additional classification information through taxonomies or postal address completion. Technical Information QFire is a web-based application developed using Microsoft .Net and requires a Microsoft SQL Server database. QFire can be installed and managed in-house or hosted in the Cloud and can to talk to most commonly-used databases. Thanks to its ease of use, QFire deploys very quickly (in a day or so) and at minimal cost and disruption to the business. Once deployed, QFire will provide huge cost savings over current methods of managing poor quality data. Don’t leave your business at risk to poor data! To find our more, call or email us today.